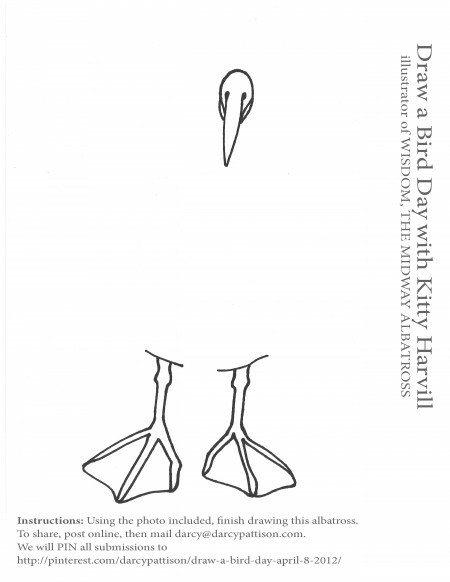 Wisdom the Midway Albatross, a story about the oldest known wild bird in the world. Share your student’s art on Pinterest. The Draw a Bird Day (http://www.dabday.com/) was created to honor the memory of Dorie Cooper. During World War II, she cheered up soldiers by encouraging them to draw birds. Soon the walls of the sick ward was covered with bird pictures. When ten-year old Dorie died in 1946, her coffin was covered with drawings from soldiers, nurses and doctors. To remember her life and inspiration, Draw A Bird Day asks people to simply draw a bird and share it with someone on April 8. Because April 8 falls on Easter this year, we are encouraging parents and teachers to do the Draw a Bird activities the week before or after. To participate, download the creative coloring pages and use them to draw birds with kids. Facebook Event page: Please join here. Then, you add in any emails you want to invite Friends. The WISDOM THE MIDWAY ALBATROSS website actual blog post which explains the event and has the pdf downloads. The Pinterest Page for Sharing. What a great way to make readers participants in the story! Excellent idea and thank you for sharing.